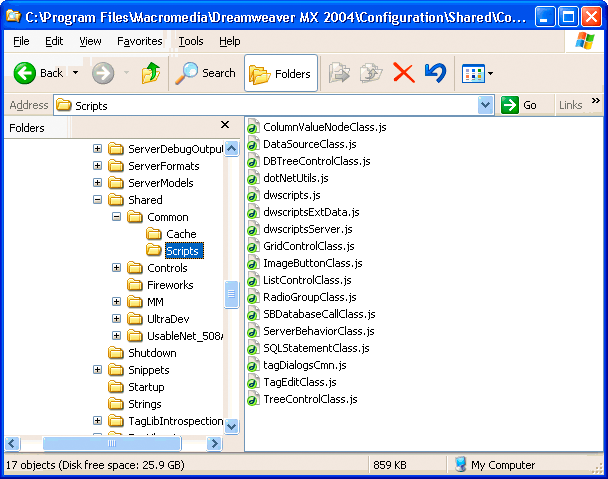 The folders and files that are stored in the Dreamweaver Configuration folder contain the extensions that come with Dreamweaver. When you write an extension, you must save the files in the proper folder for Dreamweaver to recognize them. For example, if you create a Property inspector extension, you save the files in the Configuration/Inspectors folder. If you download and install an extension from the Adobe Exchange website (www.adobe.com/go/exchange), the Extension Manager automatically saves the extension files to the proper folders. You can use the files in the Dreamweaver Configuration folder as examples, but these files are generally more complex than the average extension that is available on the Adobe Exchange website. For more information on the contents of each subfolder within the Configuration folder, see the Configuration_ReadMe.htm file. For more information about the Shared folder, see The Shared folder. If you place a command file in the Configuration/Startup folder, the command runs as Dreamweaver starts up. Startup commands load before the menus.xml file, before the files in the ThirdPartyTags folder, and before any other commands, objects, behaviors, inspectors, floating panels, or translators. You can use startup commands to modify the menus.xml file or other extension files. You can also show warnings, prompt the user for information, or call the dreamweaver.runCommand() function. However, from within the Startup folder, you cannot call a command that expects a valid Document Object Model (DOM). For information about the Dreamweaver DOM, see The Dreamweaver Document Object Model. For more information about commands, see Commands. For more information about the dreamweaver.runCommand() function, see the Dreamweaver API Reference. If you edit an extension while you are working in Dreamweaver, you can reload the extensions so that Dreamweaver recognizes the change. Control-click (Windows) or Option-click (Macintosh) the Categories menu in the title bar of the Insert panel. note: This option is not visible when you are in Tabs mode. If you are in the Tabs mode, right click Panel menu (top-left). Select Show as Menu, then Ctrl-click on Common to get the menu with the Reload Extensions command. In a multiuser operating system, edit copies of configuration files in your user Configuration folder rather than editing master configuration files. For more information, see Configuration folders and extensions.